Although technically Johnny Roselli was a mere soldier in the Chicago Outfit, he was one of its most potent powerhouses, serving as the mob's—and Sam Giancana's—representative in Las Vegas. All the family's business there had to be coordinated by Roselli. It was he who looked after Chicago's portion of the skim and decided when a Las Vegas offense required a "hit." This was true even though Roselli always followed the Chicago (and other mobs') doctrine: Kills had to take place outside Nevada or, at the very least, a corpse had to be dumped beyond state lines so there would be no heat. Roselli was born Filippo Sacco in Esteria, Italy, and came to America in 1911 with his mother. They settled in East Boston where his father, who had gone ahead, was working. His father died suddenly, and Johnny's mother remarried. His stepfather, Roselli maintained, turned him to a life of crime by talking him into burning down the family home. The stepfather then decamped with the insurance money. Because the insurance company was suspicious of young Sacco, he quit school in the seventh grade and ran away from home, never again contacting his family, although he did arrange through the years to have money sent to them. 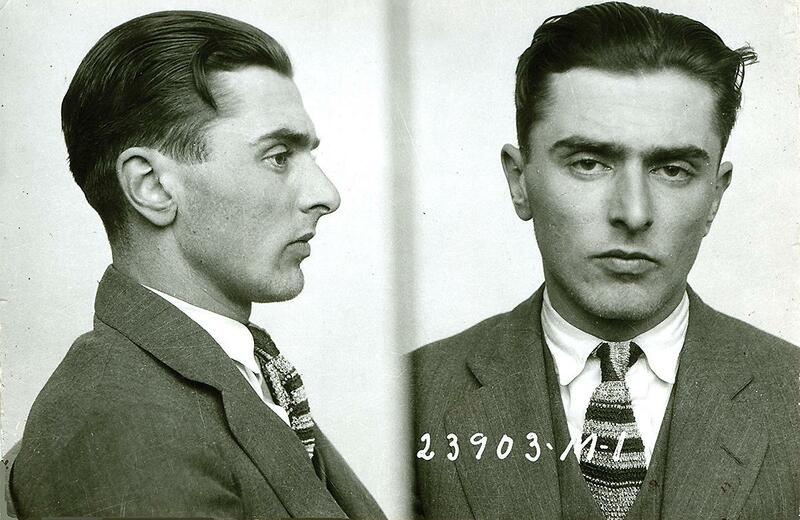 Using the name of Johnny Roselli, he hooked up with the Capone Mob and continued to grow within the mob after Capone's fall. In the late 1930s Roselli represented Chicago's interests in Hollywood and extorted $1 million from movie companies by threatening to have unions under his control slow production, causing studio costs to soar. Sentenced along with a number of Chicago crime figures, Roselli did three years for the caper but returned to Hollywood still a powerhouse. He even produced a number of crime films, including He Walked By Night, in which the law always triumphed—not over organized crime but rather over lone-wolf-type criminals. If he'd had his druthers, Roselli would have given up his life of crime to become a maker of Hollywood B-movies. His idea of the top man in Hollywood was Brynie Foy, known at Warners as the "Keeper of the B's." Roselli clearly loved the Hollywood life and even made it into the fabled Friars Club. It was an event to remembered by other Friars. In 1968 Roselli and four confederates swindled a number of Hollywood personalities—including singer Tony Martin and comedians Phil Silvers and Zeppo Marx—out of $400,000 in a crooked card game. It was a typical Chicago Outfit caper, involving peepholes in the ceiling so that observers could see the players' cards and signal a confederate in the game via equipment he wore in a girdle under his clothes. That Roselli could take Zeppo Marx in such a scam was a tribute to his ability, since Zeppo was one of Hollywood's shrewdest crooked gamblers. None of this altered Roselli's role in Las Vegas as Chicago's rep, and it was a credit to his efforts that such major operators as Moe Dalitz and Meyer Lansky never shorted the outfit. Roselli was linked along with his superior, Chicago boss Sam Giancana, with Operation Mongoose, the so-called CIA-Mafia plot to assassinate Cuba's Fidel Castro. Castro had tossed the underworld out of Cuba, and the Lansky-Chicago forces were out a fortune from their shuttered Havana casinos. Giancana figured that killing Castro would open up Cuba once more. Roselli was perhaps a bit more sanguine. He realized the plot would get nowhere and like certain other Mafia leaders, such as Tampa's Santo Trafficante Jr., used Mongoose as a scam to swindle the CIA. In 1975 Roselli testified at a special hearing of the Senate Intelligence Committee five days after Giancana had been murdered in his Oak Park, Illinois, home. Giancana had also been subpoenaed, but his death prevented his testimony. There was considerable speculation that Giancana was killed because certain elements, either in the underworld or in the CIA, did not want the scamming of the intelligence agency known. Roselli solved his testimony problem by talking much and saying little. He disclosed some details of Mongoose, and said he looked upon his efforts as a "patriotic" expression of his love for his country. He said that plots involving poison pills and poisoned cigars had failed. He did not tell the senators that no poison ever went to Cuba, that instead the mobsters had simply flushed it down the toilet. They did not do the same with CIA funds given them to organize the various plots with their supposed Cuban allies. After his CIA testimony, Roselli's lawyer urged him to hire a bodyguard, but Roselli laughed it off. He had done long service to the mob and felt he was safe going into retirement in Plantation, Florida. "Who would want to kill an old man like me?" he asked. Privately, however, Roselli was talking about the way the CIA had been conned. He was known to have become friendly with columnist Jack Anderson. What he might have been saying was probably discomforting to some people. In late July Roselli was asphyxiated, and his body sealed in a 55-gallon oil drum. Holes were punched in the drum and heavy chains coiled around it to weigh it down, and the drum was dumped into Florida waters. The idea was to make the drum stay down indefinitely, but gases caused by the decomposing body brought the drum to the surface. "Deep Six for Johnny," Time magazine headlined its full-page story on Roselli. The magazine noted: "Roselli was one of a breed that is dying off—usually by murder."